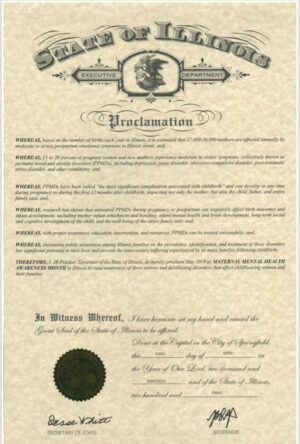 The Illinois PPD Alliance has worked with Illinois Governors for the last 16 years in order to get May proclaimed Maternal Mental Health Awareness Month in Illinois. Our hope is that the proclamation will help bring more awareness of the prevalence, symptoms and effects perinatal mood disorders can have on women and their families. We also hope that hospitals and treatment centers will use the month to promote awareness in their communities and the disorders and the services that they have for pregnant and postpartum moms to help them get better. All the events that promote Maternal Mental Health Awareness Month in Illinois are listed on our Events page. Chicago, Illinois — Illinois Governor Pritzker is proclaiming May Maternal Mental Health Awareness Month in order to raise awareness of the common illness experienced by moms and moms-to-be. There will be events across Illinois to celebrate Maternal Mental Health Awareness Month and they are listed on the PPD Alliance of Illinois Events page https://www.ppdil.org/events/. Dr. Sarah Allen, director of the PPD Alliance of Illinois says they are choosing May, as it is home to Mother’s Day, to educate women and their families and friends about the nature of this illness. Approximately 15% of pregnant women and 15% – 20% of new mothers experience major or minor depression in the first year after giving birth. Methodological differences among the studies make the actual prevalence rate unclear. Also, this are statistics from women reporting how they feel, the actual number is probably much higher. “We want women to realize that they are not alone, they are not to blame and with help, you can be well again”, said Dr. Sarah Allen, Director PPD IL Alliance. 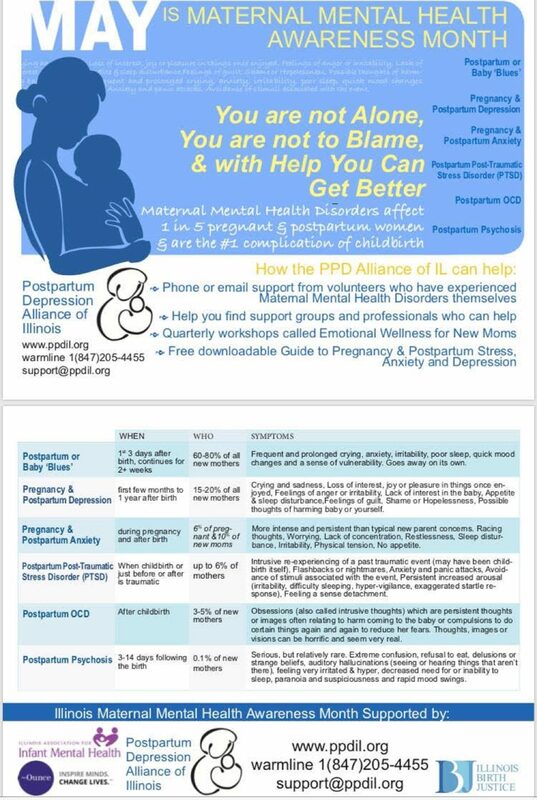 For more information about pregnancy & postpartum mood disorders & Maternal Mental Health Awareness Month contact: Dr. Sarah Allen, Director IL PPD Alliance at 847 791 -7722 or Email Dr. Allen.